I long wanted to have a good photo frame. Then from somewhere came the idea of using a tablet as one. 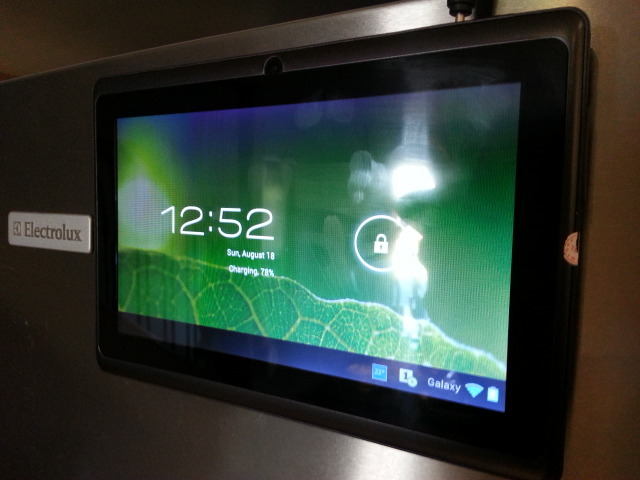 After deciding for months on what tablet to get finally I went for a cheap no-brand android tablet under $60. It is a 7″ Android 4.0 from ebay with 512 RAM, 1.2 GHz CPU, 4GB internal memory, wifi, camera, etc. Using a $2.5 slide show application from Google Play I can show photos from network. At this time we have around 35,000 photos sitting in the NAS to be viewed! This is not just a photo viewer. I have also installed few useful apps and widgets to show calendar, weather, etc that we use when we are tired of seeing photos! We can also quickly check emails or facebook while standing although hasn’t happened yet! My wife was initially sceptic of the whole idea but now she seems happy about the final setup. I also have to confess that at first I wasn’t quite confident of a tablet with that price range and 800×600 resolution but it is producing pretty decent images.